The most acute problems that internally displaced persons from Donbas are concerned with now are the issues of employment and housing. However, the government has not yet demonstrated the ability to solve these urgent issues. 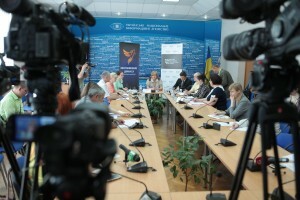 These issues and possible ways of providing jobs and housing were discussed at a roundtable organized by the Community Initiative "Restoring Donbas" in association with the Ukrainian Institute of strategies of global development and adaptation. According to the head of CI "Restoring Donbas" Elena Petryaeva, from the beginning of the conflict only 9 thousand 300 people, out of 272 thousand IDPs of working age, were employed by the state employment centers. This demonstrates the lack of effectiveness of state employment services. "Such a low percentage of employed is explained by the fact that there is a real imbalance between professions of candidates and vacancies proposed by employment centers. In addition, only 6% of vacancies, offered to IDPs, imply provision of housing, and this is a critical juncture for many applicants, "- emphasizes Elena Petryaeva. A possible solution to the problem of employment may be adoption of an appropriate comprehensive state target program. According to estimates of the Ukrainian Institute of strategies of global development and adaptation the total cost of such complex employment program may vary at the level of 7 billion 100 million Hryvnia. "The State should focus on requalification and re-training of IDPs - it is about UAH 100 million. It is also necessary to initiate global infrastructure projects, such as motorway construction – it implies expenses at the level of UAH 7 billion. To start the program of assistance to IDPs in development of small and medium-sized businesses - from 5 to 10 million Hryvnia. Also, flows of IDPs within the country should be streamlined based on the analysis of needs in the labor force - creation of such an information system will require another UAH 5 million", - reveals the results of a study of the Institute Doctor of Economic Sciences Igor Grozny. According to monitoring data of assistance requests from IDPs from Donbas, the second most important problem for them – is the issue of provision of housing. Thus, according to CI "Restoring Donbas", as of May 2015 493,000 families have left the territory of conflict. About 340 thousand of them have settled in the cities, and 153 thousand - in rural areas. Wherein the largest number - more than 80% settled in the areas adjacent to ATO area - Donetsk, Lugansk, Kharkiv, Dnipropetrovsk and Zaporizhzhya regions, as well as in Kiev. According to estimates of the Ukrainian Institute of strategies of global development and adaptation in order to provide for minimum needs of displaced persons from Donbas in housing: in the city – it is a 1 bedroom apartment on the secondary market, and in the village – it is a typical wood-framed house, it is required from 6 to 9 billion US dollars. According to the current exchange rate - it is from 120 to 180 billion Hryvnia – one third of the State budget of Ukraine. "Impracticable amount for the budget," - says Elena Petryaeva and suggests the State to consider a possibility of using several models of providing housing to immigrants: "This is construction of social housing, subsidized crediting and long-term lease. Moreover, these programs may be used either individually or as package". For its part, Community Initiative "Restoring Donbas" has already launched several services on its Internet platform which help displaced people in the search of housing, employment, provide legal advice, run a virtual office of mutual assistance. It is planned to start provision of free assistance in tax matters. The Initiative website also contains database of nearly 100 points of assistance to IDPs throughout Ukraine. The government is trying to improve the work with IDPs from Donbas: there is a certain progress in providing access to education and medicine. Mechanism of social payments to temporarily displaced people has been streamlined. There are some good examples of professional retraining of IDPs. However, all these efforts are fragmentary and do not solve the problem of internally displaced people comprehensively. CI "Restoring Donbas" emphasizes that there are options and opportunities for solving problems of IDPs. However, for this purposes, the state should establish an effective mechanism of work with IDPs. For example, having created a special authorized agency on the work with immigrants and having adopted necessary comprehensive state programs. "Unfortunately, a single agency that would deal with issues of internally displaced persons, and in the long run – with issues of restoration of war-ravaged Donbass, has not yet started working in Ukraine. State agency, established in September last year, exists only on paper. During the first 9 months of its operation it has done absolutely nothing",- says the head of the Community Initiative "Restoring Donbas". 1. Specialized state authority in the format of a Ministry or the State Committee. 2. An independent agency, working in partnership with international organizations and experts. "Both options are possible and may be effective. But with one mandatory prerequisite - full transparency and public scrutiny. And our organization is ready to provide any assistance in its creation and work", - said the head of Community Initiative "Restoring Donbas" Elena Petryaeva. As noted by Elena Petryaeva, one of the first steps of such an authority must be development of comprehensive programs that would contribute to economic activity of IDPs - employment and placement programs. Establishment of Centers of servicing of IDPs (CSI), which would operate according to the principle of a "single window" could also become an effective mechanism of solving problems of IDPs from Donbas. Both, representatives of all the necessary authorities, volunteers, charitable organizations and representatives of business can work in these CSIs.